New Site Design for May Richer Fuller Be! 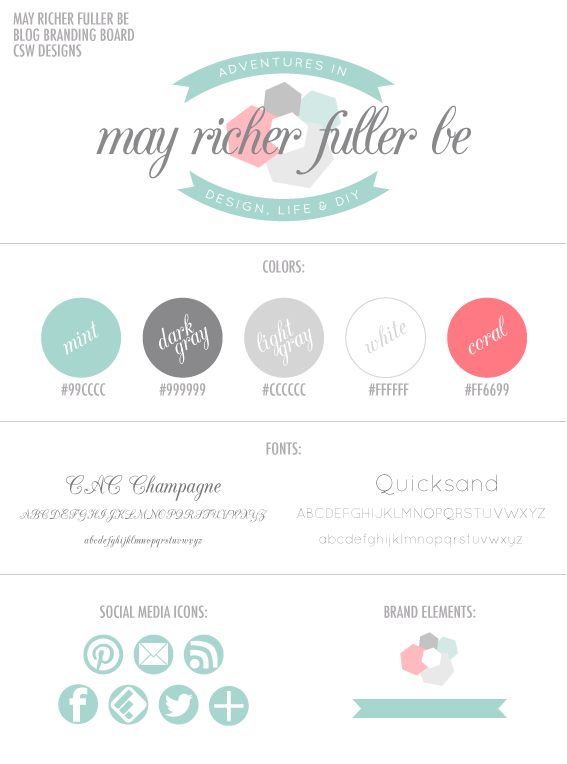 Over the weekend, I launched a new site design for May Richer Fuller Be! I’ve been thinking about giving the blog a makeover for awhile, and finally got a chance to put it all together yesterday. I wanted something simple, fresh and modern - but timeless so I don’t feel the need to a change in a few months. I had a lot of fun doing the design work and pushing my skills in Illustrator to come up with what you see today. The header was definitely the most fun to create. To gather inspiration, I made a secret Pinterest board and became a pinning machine for a few days to come up with lots of ideas for how I wanted the blog header to look and feel, and used that as a jumping off point for the design. If you’re at a loss for where to start on any sort of design project, I definitely suggest giving that method a try. I went through a lot of drafts for the header before I came up with the one you see here, and I’m really excited about how it turned out! I want to say a special thanks to a few of my blogging friends (you know who you are :)) for letting me show them a sneak peek and give me feedback on it before it went live. The two brand elements - the hexagon cluster and the banner - are simple and clean, which I feel like represents the look and feel I was going for with this design. I've always loved hexagons, and they were actually a part of the old site design, but you probably couldn't tell because they were subtly incorporated into the pattern I used to fill the header text (to see the old design, head to this post). The hexagon cluster is fun and modern, but still gives me a clean look. I love that it incorporates all of the blog’s colors: mint, coral, light gray, dark gray and white. I'm excited about incorporating the hexagon cluster and the banner into future posts! As far as the colors go, I loved the aqua and grays theme that I had going before, but I wanted to tweak the aqua so that it leaned a little more toward mint family. I also added coral to the mix because I wanted a fun accent color to throw in every now and then. Coral has been one of my favorite colors to work with in DIY projects (like my headboard and this stool), so heck, why not add it to the blog design? The typefaces (fonts) I chose are actually very similar to the others I was using before (Freebooter Script and Champagne & Limousines), but the new ones - CAC Champagne and Quicksand - just felt right for the fresh feel of the blog. Sometimes you’ve just gotta go with your gut on that stuff, ya know? They’re both free for personal and commercial use by the way, which is always a plus if you’re in the market for some new typefaces yourself. All in all, I’m pretty psyched about the new site. I still need to do some tweaking on some of the pages, but for the most part, it’s ready to go. My about page got some new photos thanks to my mom and her awesome photography skills, so feel free to poke around there if you’d like. It was finally warm enough this weekend to get outside and take some photos without worrying about freezing our tails off! Hooray for signs of spring! I’ve really found that I have a passion for simple and clean graphic design, so if you ever find yourself in the market for some design work and you like what you see here, shoot me an email. CSW Designs is for hire!